Horsham paid the price for a off-day in front of goal as they slipped to a undeserved 1-0 defeat at Phoenix Sports this afternoon. An Alex Teniola goal in the second half saw the London-based hosts secure their first victory in eight attempts in the Bostik League South East Division. The result saw play-off chasing Horsham slip a place to fourth in the standings and they will be cursing their own finishing after having by far the better opportunities. They had a host of decent chance throughout the game - the best seeing Steve Metcalf hitting a post and Rob O'Toole somehow not finishing after a great move involving Jack Brivio - while Phoenix had just one attempt on target in the second half. Goalkeeper Josh Pelling had few real saves to make during the 90 minutes, but a defensive mix-up allowed Teniola the only goal of the afternoon after the Hornets stopper called for the ball and didn't make the clearance in the 67th minute. To their credit, the hosts defended well on the small and sloping pitch in London and former Horsham stopper Steve Phillips in their goal, put in a solid display to earn their clean sheet. 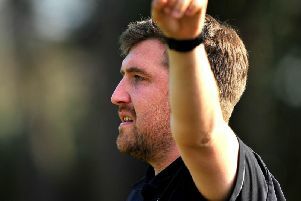 Horsham manager Dominic Di Paola was back in the dugout having missed last week's 1-0 victory over Whyteleafe and the management team made one change to the side that grabbed that late win. Lewis Hyde, back from his loan spell at Southern Combination League side Pagham, slotted into the back four at centre-back for the absent Dylan Merchant. Horsham's first chance came in the fifth minute when a well-weighted cross from Metcalf found a rising O'Toole at the far post, but the striker headed over the crossbar having had the beating of his marker. The visitors continued on the front foot and forced a number of corners which were well defended by Phoenix. They also cut out a promising move that saw Lee Harding find space on the right, but his ball attempting to find either O'Toole or Chris Smith, was blocked away. The hosts looked to build through the imposing Jeff Duah-Kessie and their first real chance came as a header from Joe Shelley dropped in a dangerous area and Kweku Ansah forced a save from Pelling. On 23 minutes, the ball was worked across the Phoenix midfield to Lewis Clarke on the left, who had time and space to pick out the surging Duah-Kessie, but his glancing header whistled just past the bar. Just past the half-hour mark, a neat O'Toole flick put the ball into the path of strike partner Smith who forced a save from former Horsham man Phillips at his near post. Six minutes before the break an O'Toole cross looked to pick out Smith, but Phillips raced out to touch the ball off the forward's head and then block Harding's follow-up effort. The visitors had the ball in the back of the net on the stroke of half-time as O'Toole tapped in Charlie Harris' deflected shot that wrong-footed Phillips, but the flag was up for offside. Metcalf cracked an effort onto the outside of the far post four minutes into the second half as a Harding ball across the box was blocked away and the full- back battled to win the loose ball and hit a shot from 18 yards out. Soon after Brivio didn't get enough on his back-post glancing header from a Harvey Sparks cross and Harris' follow-up from long range was watched and held by Phillips. The visitors should have led on 57 minutes after a lovely bit of build-up play. Brivio played a neat one-two and jinked into the box, but unselfishly squared for O'Toole, but someone Phillips smothered the ball away when the striker looked certain to score. Moments later, the ball ran across the box to the arriving Harris, but his angled effort was well blocked away by Phoenix's Danny Young. The hosts went ahead of 66 minutes in what was their first real effort on target. It came from a mix-up at the back that allowed Teniola to nip in an apply the delicate finishing touch that crept over the line. The Horsham bench responded by sending on last week's match winner Tyrell Richardson-Brown and returning loanee Kieran Lavery. They came up against a Phoenix back four that stood strong against some mounting pressure and when they were breached, Phillips continued his assured display. The stopper collected a couple of long-range efforts comfortably as the clocked ticked down - much helped by his leisurely approach to getting the ball back in play. Referee Ian Fissenden only opted to show the goalkeeper a token yellow card deep into nine minutes of additional time, rather than clamp down on the problem early on as they saw the game out. Horsham: Pelling, Metcalf, Hyde, Shelley, Sparks, Harding (Richardson-Brown 70), Harris, Brivio (Taylor 82), Hayward, O'Toole, Smith (Lavery 70). Unused: Lovegrove, Kirkwood. Phoenix Sports: Phillips, Proberts, Young, Barry, Bird (Robinson 65), Taiwo, Byron, Clarke, Ansah (Lee 82),, Teniloa (Hopkins 75), Duag-Kessie. Unused: Whitelock, Alireu.